Embroidery is old. It’s very old–so old that we don’t even know for sure how old, because new archeological discoveries can place embroidery back even further than we first surmised. The embroidered patch, however, is relatively new in comparison–if you consider the 1800’s to be “new.” They’re certainly “newer” than third century China! But you can’t have a history of embroidered patches without first taking a look at how embroidery came to exist. So grab some clothes and jump into your police box, and let’s take a trip back to the humble beginnings of the embroidered patch! There are traces of embroidery as far back as the hunting and gathering times, but it wasn’t really like the embroidery we know today. Animal sinew and hair was used to make decorations as well as to sew pelts together, and there are old paintings depicting clothing that might be decorated with embroidery. But because embroidery is such a delicate and fine craft, we don’t have much hard evidence of these early examples. There is a definitive era in which embroidery is said to have developed, and that, like many other fine crafts that still exist today, came from ancient China. The earliest record of the birth of embroidery as a craft comes from China’s warring States era, in 3rd to 5th century BC. See how definitive history is? A margin of about three-hundred years gives us a ballpark estimation for when the craft was truly developed. That’s accuracy for you! As you may have already guessed, embroidery itself is very much an Asian invention. Just take a look at ancient Asian clothing, from Chinese to Persian, and compare it to the garb of the Romans or the Greek’s. Or even just the designs on their awesome old artwork and things. 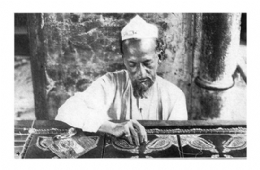 Ornamentation is a necessity in the orient. Or at least for the rich orient. So embroidery spread from ancient China to Persia and India and even Japan. It was refined as the centuries drew on, and soon embroidered garments became elaborate, beautiful designs that only the most elite could afford to wear. Gold was twisted into thread and used to great effect, as was silk, pearls, and jewels to make things even more expensive and unattainable except for the only the wealthiest of people. One of the most interesting things about embroidery is the fact that there are only a handful of techniques to the craft, and even with the invention of machine embroidery, these techniques haven’t changed. Embroidered designs still use the chain stitch, blanket stitch, running stitch, satin stitch, and cross stitch, all of which were designed centuries ago. The craft only continued to grow. As we come closer to modern times, we find that embroidery caught on enormously in Medieval Europe. Professional workshops popped up everywhere, creating garments for kings and nobles, usually depicting religious scenes or simply displaying ones status. These shops were called Opus Anglicanum, or “English Work,” and the word Embroidery is now a very English term. As the years wore on, embroidery didn’t really change much, except perhaps for the fact that it became a hobby for fine ladies to practice at home. And then came the age of the machine and the factory. As you might imagine, embroidery was done entirely by hand up until the industrial age, and usually on a piece of clothing already made, or as a craft or hobby. The mid 1800’s and the age of invention was what changed it all, as per usual. 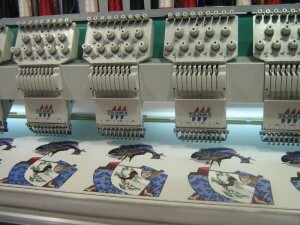 There wasn’t an all in one machine that came first for embroidery however–instead, embroidery machines came in stages, one improving on another until you come to the heavily computerized machines of today. 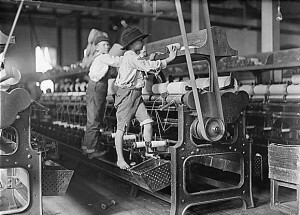 The first “machine” was the combination of a loom complete with teams of women (since embroidery was considered a very feminine pastime) embroidering things by hand. 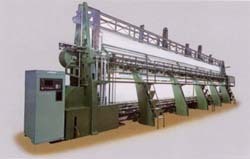 Many of the modern improvements to the machine embroidery method came out of Switzerland in the 1800’s. In the 1870’s, hand loom embroidery began to rise from the ashes of its predecessors. This method of embroidery was still operated by hand, but it was a vast improvement over individuals working on individual projects. And then the sewing machine was invented. As soon as that happened, the Schiffli Embroidery machine was born, utilizing the workings of the sewing machine to create finely embroidered garments with as little hand work as possible. The 1800’s and the newly available spread of easily attained embroidery gave rise to the embroidered patch. And, what will probably not come as a surprise, the embroidered patch came from the need to afford soldiers with visible rank. Prior to the 1800’s, soldiers had no real distinguishing adornments, except perhaps for the fact that the commander might get a fancier hat. So as a way to honor the higher ranks in the military, the British Army began to adorn their soldiers with embroidered patches relevant to their rank. This new idea caught on, and spread to America, especially during the Civil War. The Union Army popularized the use of embroidered patches for their soldiers. These patches were often simple and easy, something that wives or sisters would make for their soldiers to be sewn onto the shoulder. The Confederate Army tried to follow suit, but with a lack of funds, there was little unity to the Confederate patches, so soldiers would find themselves mismatched, or some soldiers wouldn’t even have patches at all. By the days of the World Wars, particularly World War II, embroidered patches had become common practice for soldiers in armies all over the world. The term SSI, or Shoulder Sleeve Insignia was born. But this time, and with the developments that took place in the late 1800’s, embroidered patches had become more intricate and were more prevalent. High ranking soldiers could have dozens of patches to honor their high ranks and achievements. Even the lowest ranking soldier had at least one patch. Merit badges for scouts also grew out of these designs. Scout programs in the UK began using embroidered patches (or “badges”) in 1907, and the practice soon came to the United States. Initially 57 badge designs were made, and most of those designs haven’t changed throughout the centuries. With the advancements in computer technology and the intricacy that can be done by machine, embroidered patches have stretched beyond a simple token of rank, and are now used in a variety of ways. Some of them may surprise you! Just think about all the embroidery you see on clothing today… and imagine how much money it would have cost you in the olden days. Scout programs and the military are still some of the most common users of the embroidered patch, but now companies use patches to adorn uniforms, groups and unions have patches made to honor their members, (biker groups are some of them!) military units make their own patches, and souvenirs and novelty patches are a hot seller in gift shops across the globe. Patches are even put on tervis tumblers now, or worn as tiny embellishments to spice up a dull t-shirt. A luxury that only the richest and most elite could afford in ancient times is now a commodity that can be bought for pocket change. 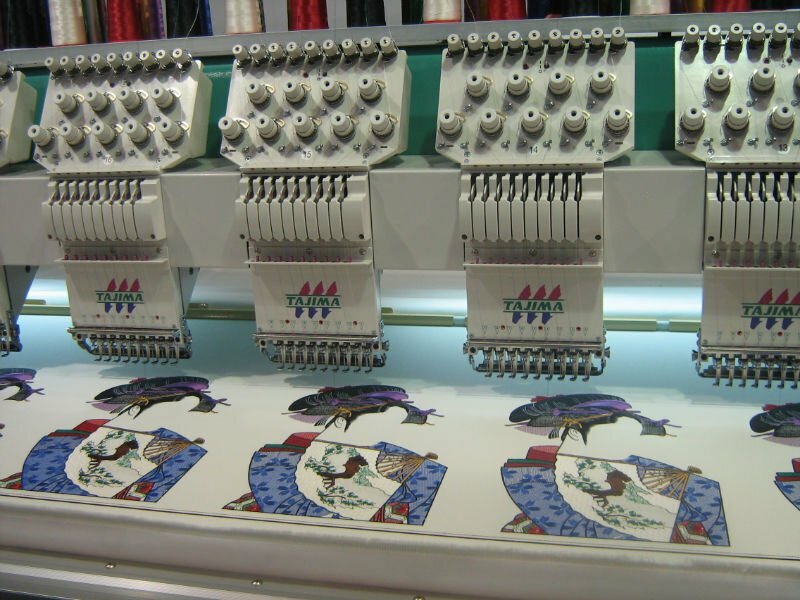 Now that embroidery can be done entirely without the help of a human operator, designs can be made at tiny or enormous sizes, feature hundreds of colors, and still come at affordable prices due to the availability of mass production. Patches have come a long way from the simple designs made by hand in the olden days, and have come to signify honor and rank in all kinds of facets. Their history has grown with us through the ages, as a way to show wealth, skills, and honors, and they’ll probably stay with us for many years to come. Embroidery isn’t going anywhere any time soon.